swim until you can't see land. : i'll put the coffee on. this is one of those magical moments where i am holed up in the library, but i do not have any homework that is sitting in my bag screaming, "EMILY I SWEAR TO GOD IF I DON'T GET DONE, YOU ARE GOING TO FLUNK OUT OF COLLEGE AND GO HOME TO LIVE WITH YOUR PARENTS AND NEVER BE A TEACHER." i just reread that and realized how dramatic it was. but seriously, i really don't have that much homework to do. and that's what's scaring me and prompting me to blog. 1. it's the sunday before finals week and i am sitting here with no homework to accomplish. i do, however, have a box of teddy grahams and a vitamin water. 2. with no homework to accomplish, i am absolutely bored out of my mind. there's a criminal minds marathon on A&E, but i don't want to leave my boyfriend alone in the library with his fascism essay. 3. i just watched the latest episode of chuck and am not entirely sure what my emotions are doing. 4. now i'm making a list about why i'm blogging in my blog. i feel that if i make this blog entirely about homework, it'll be short and weird. but what the hell, let's do it. and i really hope that you don't stop reading this because it's about homework. i swear, i'll try to make this entertaining. because my life is generally entertaining, and i feel like you're on here because you find me writing about my life at least a little bit entertaining too. so. finals week at alma college looks something like this. this also applies to the week before finals, which was last week. there are punctuated classes between hours and hours of endless studying. as you probably know, my goal is to become a teacher. i want to teach spanish and literature. my schedule doesn't truly live up to this goal. my schedule for the (now finished!) fall semester. my finals stand something like this. 1. comprehensive philosophy final on wednesday. no studying in sight. 2. educational portfolio due on friday. finished. 3. creative writing portfolio due on monday. finished. 4. four page spanish research paper in spanish. almost finished, just need to talk to my professor about my somewhat strange these that involves the word "erradicar." i'm feeling pretty good about how this is going. but while everybody is freaking out this week, i saved all of my freak out for last week. so last sunday was this super epically productive day where i decided that i was going to write my spanish paper on illiteracy in colombia. illiteracy in spanish is analfabetismo, which makes me think of "without alphabet" in greek or latin or something, and i have gotten so good at typing that word it is not even funny. but once i decided on that, i had this brilliant idea that went something like this. "hey! all of your education portfolio stuff, with the autobiography and the student interview... you could do that in two hours and then not worry about it at all and turn it in a week early and then just be like... existing on campus." i enjoy existing on campus. so that sunday i did all of my education portfolio stuff, turned it into dr. seals, went and said hi to my boss, and painted a happy birthday sign and felt pretty happy. i might've eaten some licorice. to help with my productivity, i wore a teachery outfit. i was going to print off my entire 112 page english portfolio and make it pretty. then i was going to write my entire four page paper about illiteracy in colombia in spanish and hopefully learn lots of vocabulary along the way. i holed up in my friend sarah's carrel. she's told me that i can use it, but it was covered in her scary shakespeare books for dr. aspinall's class, and no matter how much i covered it with my stuff, it didn't feel like mine. i felt guilty and texted her to let her know what i was doing. she laughed at me. i had from ten thirty until one to do a lot of work, and i spread my study wings and went to work on that portfolio. i spent a decent amount of time three hole punching my 112 page portfolio. when i finished grunting and sweating in my cute teachery outfit, i found the electronic three hole punch machine. i accidentally sent half of my portfolio down to the basement printer when i was on the third floor. after putting it together, i found i put some chunks in the wrong area. my table of contents was out of order and i had to reprint it. i did this all in my socks. then it was just sitting there in this big fat blank binder and the hipster in me thought, "naming this 'portfolio' is so incredibly mainstream and dr. vivian will be expecting it." so, i spent an indecent amount of time avoiding my spanish paper by naming my portofolio and honest to god decorating the binder. on friday dr. vivian asked if anybody wanted to turn their portfolios in, and i selfishly kept mine because it is beautiful and i am proud of my 112 pages of original work. 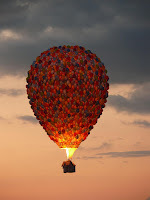 and the hot air balloon on the front of it looks like the up house. it's called "ribbons and bows". mostly because i like to wear bows in my hair. i then had from two o'clock until five o'clock back at sarah's carrel to write my spanish paper. i actually sat down and went through my 28 pages of research and highlighted what looked useful. i think that taking advanced spanish composition has made me a worse spanish reader and a worse spanish speaker. eventually i think i was just highlighting anything that said "educacion." then i spent the remaining time on tumblr and thinking about blogging about all of this. i did fill out my RA evaluations, that made me feel a bit better. after dinner i had a complete freak out where i sat on my bed and cried and fed my fish too much food so i didn't eat my own feelings. i needed to write my paper before ten o'clock (my mandatory hall meeting about christmas check-out) and it was now seven in the evening. how on earth was i supposed to write a four page argumentative research paper in another language in three hours? my best friend google translate and i busted through that four page paper in less than two hours. i left the library practically in tears and i am happy to say, i did not go back to the library until this afternoon. and after that paper was over, elf was on TV. so everybody is at least a little upset that i'm not really doing much at the moment. but i will tell you, i did far too much work (and procrastination) on thursday to make this week so much happier and healthier. i think i might actually work out this week. so now all that's left is this awful comprehensive final in philosophy. i really knew i should've paid attention to those terrible plato presentations that we did. at least my presentation involved a disney movie. i believe i'm going to go study some philosophy now and hope that tomorrow doesn't come, because i really don't want to turn in my creative writing portfolio. i am selfish. but i really like that binder. oh yes, the front of my portfolio.